Circle inked with Spun Sugar D.Inks. 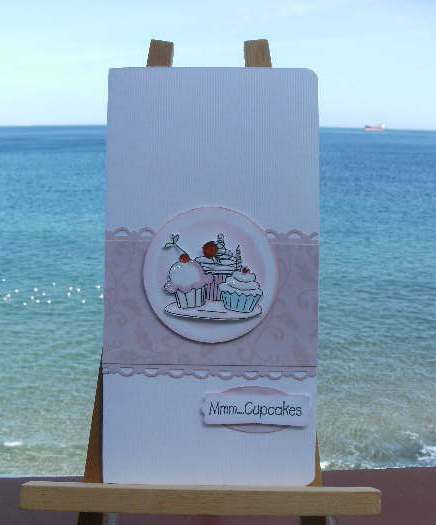 Sylvie...I LOVE this and you've inspired me to drag out my cupcake stamps and create with them! I would love to sit on your balcony and just soak in that peaceful view!! mmmmmmmmmmmm cupcakes, that sentiment is definitely right!! Beautiful cupcake image. This is a beautiful card. I love it. Glad you found some inspiration. I love the card you've made, and the cupcakes are adorable. Fabulous card Sylvie,challenges help me a lot to get started some days, although I do find that sketches are hard sometimes.Love the coloured ones, and loving your cupcakes. Another super card Sylvie... those cupcakes look great! I have that stamp, isn`t it fab. You`ve made a fantastic card with it. What more could a girl want, sea, sun and cupcakes. Lovely card great cupcakes, well done. This is lovely! I can see the sea! Hi sylvie! Thanks so much for lovely comment on my blog (: this is such a sweet cardd! Love the cupcakes! Mmmm cupcakes indeed! Your cards are always lovely Sylvie! Brilliant card Sylvie, those cupcakes are gorgeous, good enough to eat! I'd love to join you on your balcony for a game of scrabble, that's what we love to do on holiday! beautiful card, love the cupcake. Great sentiment - fabulous cupcakes. Lovely card, those cakes are good enough to eat.